364 people in our community are currently praying with you. Our "Virtual Sunday Church" this weeks takes us to a Palm Sunday processional at Church of St. Michael in Stillwater, Minn..
Giver of light,your steadfast love endures forever. Open our hearts to the Blessed One who comes so humbly, on a borrowed colt. Open before us the gates of your justice, that we may enter, confessing in heaven and on earth that Jesus is Lord. Amen. Now when they drew near to Jerusalem and came to Bethphage, to the Mount of Olives, then Jesus sent two disciples, saying to them, "Go into the village in front of you, and immediately you will find a donkey tied, and a colt with her. Untie them and bring them to me. If anyone says anything to you, you shall say, 'The Lord needs them,' and he will send them at once." Most of the crowd spread their cloaks on the road, and others cut branches from the trees and spread them on the road. 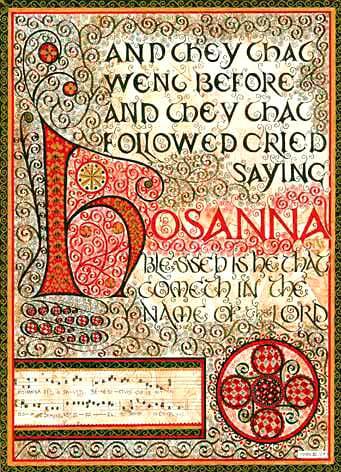 And the crowds that went before him and that followed him were shouting, "Hosanna to the Son of David! Blessed is he who comes in the name of the Lord! Hosanna in the highest!" And when he entered Jerusalem, the whole city was stirred up, saying, "Who is this?" And the crowds said, "This is the prophet Jesus, from Nazareth of Galilee." 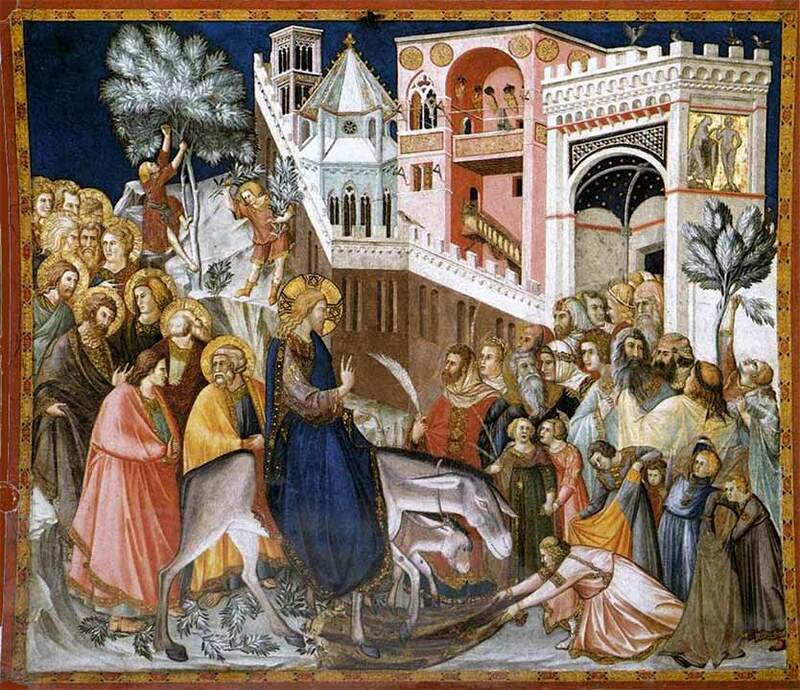 Palm Sunday is an odd holiday, because although it is essentially the triumph of Jesus becoming a king, although he rides into Jerusalem in glory and adulation, we know that he is also riding to his crucifixion. Even odder, the great King rides a donkey and her colt; imagine a British monarch riding to his coronation in a used pickup truck! It is entirely intentional. Jesus could easily have found a horse, but he wanted the most humiliating transportation he could find for his triumphant procession, because he wanted to drive home a point: His victory is the victory of humility. The people of earth spend their lives in pursuit of wealth, and instead find death. Jesus loves us more than we love ourselves, for he will show us the path to life. But we must choose to follow the man on the donkey clothed in common robes, instead of the man on the magnificent steed clothed in Robes by Armani. The United States is often called a Christian country, but you would not know it from watching television. People are drawn like flies to "red carpet" events. A telecast of a major awards ceremony, such as the Academy Awards, involves as much coverage of what $10,000 dress each celebrity is wearing as coverage of the ceremony itself. And people are easily sucked into it, unconsciously. It seems like harmless fun, and certainly the people watching aren't trying to commit some great evil. But the values of such a spectacle could not be more anti-Christian. The time and money spent on this vanity is completely wasted. "Conspicuous consumption" is buying things that cost far more than their functional value, for the sole purpose of vanity. Everyone -- or almost everyone -- engages in it to some degree. Christianity is not a religion of perfection; we all try simply to close the gap between ourselves and God, and we all fall short. But when we have money to spend, it is worthwhile to think about the distance that we put between ourselves and Christ when we spend more than we need to, simply to impress other people. But if we do decide we can spend less, especially out of love for Christ, there is a side benefit — we save money!